Cinematic Paradox: AAN: It Is All Over. And This is My 800th Post. AAN: It Is All Over. And This is My 800th Post. I only watched half of the Oscars. I decided not to go home 'sick' after all and I managed to not get my phone taken off me in class even though I checked it at least 20 times for winners. In fact, today has been an exciting day. In my English class, the teacher decided to ask the class for the 24 categories at the Oscars. Me being me, I knew all of them. As soon as the bell rung, I bolted out the door - and then the fire alarm went off, which was weird. I got home, found an online stream, but that got taken down. Luckily, a link I'd saved for last year's show worked this year. My life does not get more exciting than this. All in all, even though I wasn't as excited this year, I was still jumping for joy all day at school. I'm sad it is over. I cried during the montage, because I'm going to miss the films like War Horse breaking my heart. Now, I will go through my year catching up on all of the films I missed - The Artist, A Separation, Tinker Tailor Soldier Spy...I can't wait until May when they start rolling out all of the awards season movies on DVD. While I felt that last year was better, at least it wasn't The King's Speech fronting this year of film. -We all knew that The Artist was going to win Best Picture. But I was doubtful, considering how strong Hugo was at the start of the show. Hopefully the win will speed up The Artist's expansion in NZ. -I AM SO UNBELIEVABLY PISSED THAT VIOLA DAVIS DID NOT WIN BEST ACTRESS. I wanted Rooney Mara to win (and what a clip they showed of her), but this was the year for Viola. Anyway, Meryl Streep is a goddess. I loved what Colin Firth said to her. I miss him winning things. -Even though I haven't seen The Artist, I am so glad that Jean Dujardin won. Anyone but George Clooney. I loved Jean's speech, too, I learned a thing or two from that. -I missed Octavia Spencer winning, but I'm happy about her win. I'm not even pissed about Jessica Chastain losing, because I know that she is the next Meryl Streep. 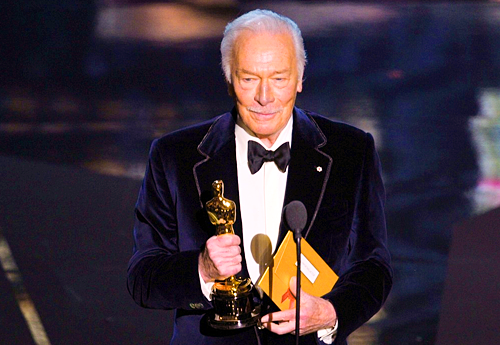 -Christopher Plummer had one of the best speeches of the night. There were many great speeches, but his was awesome. I love Beginners...I suddenly feel like watching it again. -Michel Hazanavicius won Best Director. Knew it was going to happen. I thought it was cool how the actors talked about them, and Jessica Chastain talked about Terrence Malick. But at least I learnt how to spell Hazanavicius (achievement of the year). -Best Original Screenplay for Midnight in Paris. Oh Woody Allen, I love how you choose not to show up. -I was quite pissed that The Descendants won Adapted Screenplay. And that they played a clip of Sid, aka the worst written character I've seen in quite some time, for it. But all was forgiven when one of the writers took the piss outta Angelina Jolie. -Best Animated for Rango. A couple of my classmates asked me why the hell Tintin wasn't nominated. I wasn't sure how to answer. -I still need to see A Separation. Hopefully it's win will push along some NZ cinemas. -LOL. Undefeated was my 'overwhelmed Owen' for the Doco Oscar. LOL. -Harry Potter didn't win anything. I can't understand the logic behind all of this. -I also can't believe that The Tree of Life lost Best Cinematography. I'm so unbelievably pissed about that one...it literally made it impossible for me to concentrate on biology because I was so pissed. -Hugo won a lot of technical awards. It was a bit of an Inception. Arghhh I miss Inception winning stuff. -But the win of the night was definitely Bret McKenzie winning for 'Man or Muppet'. I'm so happy, and couldn't be a prouder Kiwi...and I can officially say that I know an Oscar winners Dad (how many of y'all can say that?) 'Man or Muppet' is such a great song - I've had a The Muppets medley in my head all day. I love what McKenzie said backstage that New Zealand produces a lot of Oscar winners "because you can do what you want there. Everyone in America is so obsessed with their careers." Bless him. That's why I want to be another one of those NZ Oscar winners. If only. -Michelle Williams is so angelic...when Colin Firth was talking about her she literally looked like she was sent from the heaven's above. I loved her dress, plain and simple. 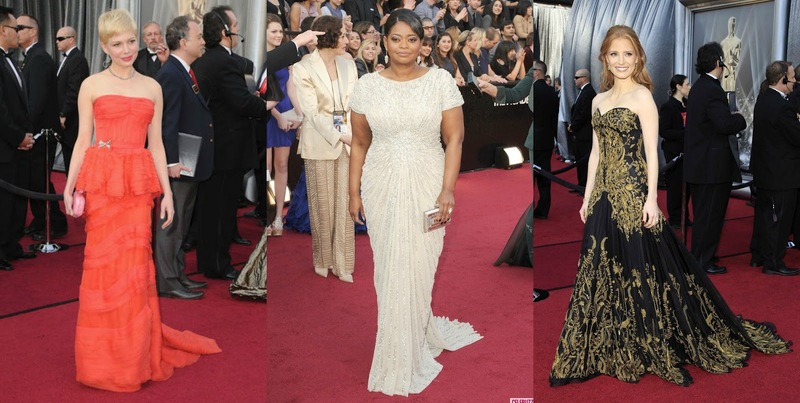 -Octavia Spencer has looked so consistently great this awards season. It may not top her purple Golden Globes dress, but she still looked like an Oscar winner. -Why was Anna Faris at the Oscars? Eh. I don't like sequins at the best of times, but black sequins with a sleeved dress isn't my idea of an Oscars dress. -Eh, Jennifer Lopez. It looks like a strangely cut picnic cloth. -Again with the sequins! It's not that I don't like Judy Greer, but that dress would probably not work on anyone. Anyway, the Oscars are over, which means that Annual Awards Nerdism is over for another year (I'm gonna cry now). I only got 13 predictions right...which is not my best year at all. I'm definitely going to miss this series. I'm going to miss Happy Fassy, Lowkey Loki and Overwhelmed Owen. It feels like just yesterday that I thought of them! If you kept up with the series, thank you so much. From the bottom of my heart. I know it is so boring to have countless awards posts clogging up your field and that mine was just another one of them, so thank you for reading! Bring on the 2013 awards season! Oh yeah - and this was my 800th post! Amazing stuff! I was surprised that I ended up tuning into the Oscars. I was at work, bored, so I figured why not? While many of them pissed me off a lot, I thought overall it was equally as bad as any other year, with the usual scattered highlights and cliche-ridden montages. Plummer and Dujardin both gave phenomenal speeches, though. Phew. Glad all that's over. I liked the montages. Everyone gave great speeches IMO. I stayed awake with coke all night to watch the show and don't even feel tired... Nice post :). HAHAH I love that you enjoy the oscars so much Stevee, I really am over it all now. I was going to try and stay up, but my bed was calling, and to be honest I am glad all seemed a little dull.. Roll on 2012 and the blockbusters!! Scott - 2012 is going to be a GREAT year for film! Sati - Haha, I loved seeing Dujardin go all crazy. That's what I would do if I won an Oscar. Congrats on your 800th post! I totally agree on your best dressed, worst dressed list, although I must say I was a bit dissapointed in the fashion department this year, nothing really extraordinary! Jessica Chastain looked AMAZING and you are right, her hair was perfect! Although I am going to miss Fassy, Loki and Owen, I am happy to get out of this awards madness and focus on movies again! Yeah, it was a pretty disappointing year for fashion. Jessica Chastain is so perfect I swear she isn't human! And I'm glad to get out of it too...although it wasn't as mad as last year! Congrats on your 800th post!! Keep up the great work, Stevee. "I AM SO UNBELIEVABLY PISSED THAT VIOLA DAVIS DID NOT WIN BEST ACTRESS" Yep, me too! Oh and I totally agree w/ your Best Dresses picks too, I LOOOOOVE the red shade of Michelle's dress, and the shape just fits her perfectly. And that McQueen gown of Chastain, absolutely stunning!! Thanks! Michelle always looks great in red. And Jessica...oh I do love her.